IBPS Clerk Prelims exam is scheduled to be held from today. Your positive actions combined with positive thinking results in success. All the IBPS Clerk aspirants would be waiting for this Exam as it will bring him a step closer to join public sector Bank. we wishes you all a very good luck for todays's IBPS Clerk Prelims Examination. Do not start anything new today or try to pull an all-nighter as it will do no good on the last day before the Examination. The only way to remain confident during todays's examination is to have the important topics all grasped. Stay calm and revise all the things that you are already done with. It's the time when you are very close to your goal that you have been dreaming for since the day you started your preparations for the competitive examinations. Now, the only thing that you have to bear in mind is not to let this opportunity go in vain and perform to the best of your ability to live the sybaritic life lying ahead post your selection in a public sector bank. 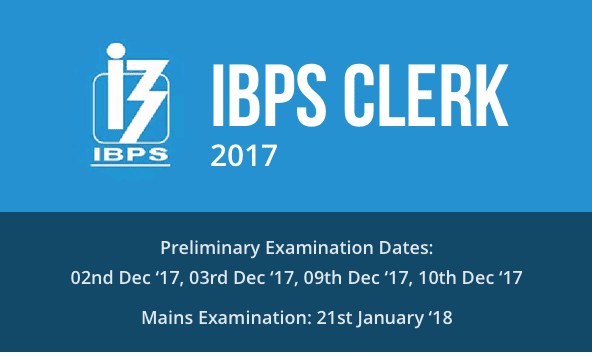 And yes, it is going to be a difficult exam as it is the mains examination of IBPS Clerk Prelims 2017 but you do not have to let this thought run through your mind while attempting the examination as it can spoil your performance. Sleep well tonight and get all the things important for the examination ready in advance. Now take a print out of your admit card and photo identity proof in advance as waiting for the last moment is not in your favor. Do reach the exam center well ahead of time to avoid any unnecessary tension. Do confirm the location and all other important things that you need to know about your center in advance so that you don’t waste much of your time in search of your center.